Are you ready for the best summer of your life? 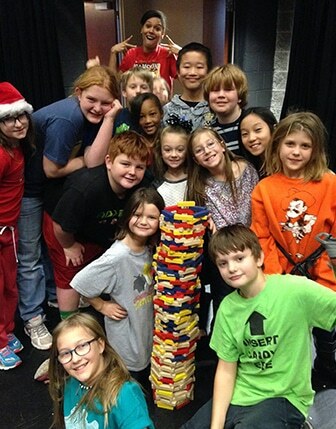 Each summer hundreds of kids choose to spend their summer with Oklahoma Children’s Theatre. Its start to finish of endless fun as we present weekly sessions filled with creative visual and performing arts opportunities. Oklahoma Children's Theatre has proudly been serving the Oklahoma City Community for over thirty years, bringing live theatre and performing arts experiences to stages and classrooms across the state. Each year we present a professional theatre season, we tour theatre productions to rural communities, we engage with local schools with our in-school literacy programs, we host exciting special events for children, we interact with our community at street festivals and public events, we provide educational opportunities through after-school classes, we develop leadership skills through our teenage Youth Advisory Board, we host snow day camps when school is out, and much more. Every summer we offer a wide range of summer camps for Oklahoman children, including Preschool classes, multi-week productions, and a massive collection of week-long day camps in theatre, visual arts, dance, Broadway, magic, video game design, filmmaking, and dozens of other specialty subjects. Whether you're a family looking for friendly and affordable daycare throughout the summer season, or just interested in providing safe and engaging arts opportunities for your children, our summer camp program is the perfect answer for young people of any age. Our upcoming Summer Camp season begins May 28th, 2019.